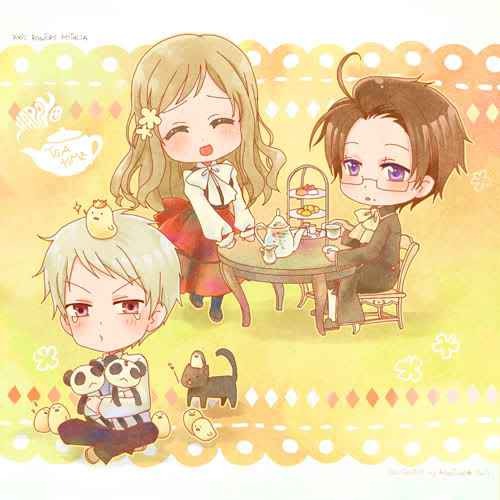 Hungary, Austria, and Prussia. . Wallpaper and background images in the Hetalia Axis Powers - Incapacitalia club tagged: hetalia prussia aph austria hungary kitty panda gilbird. This Hetalia Axis Powers - Incapacitalia photo contains anime, fumetti, manga, and cartoni animati. Gakuen Hetalia Axis Powers - Incapacitalia screenshot Okiku doll? A Guide to Scrivere Fanfictions and Roleplaying Accurately. Really Hetalia Axis Powers - Incapacitalia fandom.....really?